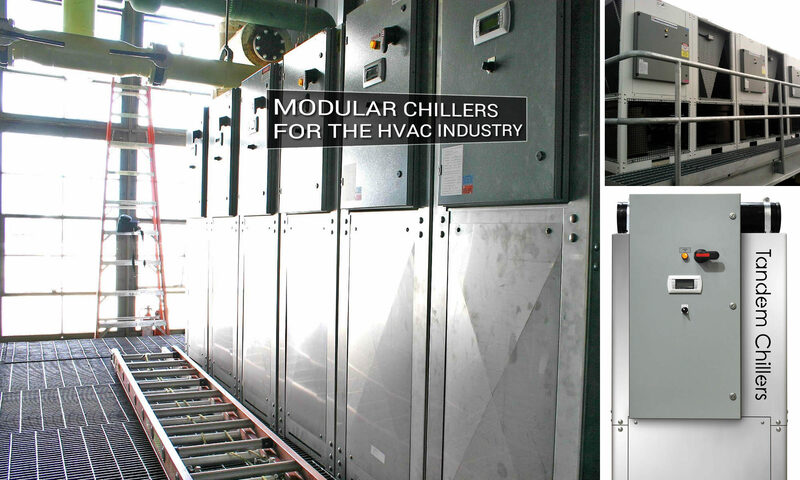 For many in the air conditioning industry, modular chillers are a dream come true. As cooling and air conditioning systems continue to age and the demand on them rises, chiller conversion and replacement decisions are imminent for most building and facility managers. There are many options to choose from and choosing the right solution means a lot of research. When it comes to building renovations, retrofits, or the replacing of existing cooling systems that are either too expensive to repair or operate, modular chillers are often the perfect solution. Our modular chillers are a popular alternative to conventional chilling systems for three main reasons: low installation costs, low operating costs and low maintenance or repair costs. 1. Low installation costs are an important consideration for anyone who has to install a cooling system in the basement of an older building or in a mechanical room on the top floor of a multi-story building without altering the building. 2. Low operation costs are just as important, if you want a cooling system that is energy efficient, expandable, reliable, quiet and environmentally friendly. A modular chiller is more efficient than the older centrifugal chiller under full and part-load conditions, which can mean significant savings given that most chillers operate 95 percent of the time or more under part-load conditions. 3. Low maintenance and repair costs are one more reason to go with a modular chilling solution. This cost, however, is not the same for every modular chiller design. Some designs absorb the cost associated with equipment failure, by giving you the option to purchase a backup unit in case the primary chiller breaks down. Replacing your air conditioning system with a modular chiller is not a decision you can make until you are confident that this solution will work for your own particular building. Older buildings, hi-rise apartments, office buildings, hospitals and casinos each present their own unique challenges. Each building has its own distinctive function and structure, which will have an impact on your decision. More often than not, the decision to replace is driven by long-term costs. Aside from lower installation and maintenance costs, a new modular chiller gives you the opportunity to better match current and future cooling demands. Determine how many tons of cooling are required to meet the variable cooling loads created by the building, such as climate, number of people traveling through the building, the type of equipment , etc. Determine how difficult it will be to install a chiller in your building. In most cases the room where the chiller is going to be installed is accessed through a narrow staircase, hallway or by elevator. In many instances, buildings were constructed around the cooling system, making it virtually impossible to extract the old system and replace it with a new one. Physical site constraints often demand that the installation of a modular chiller unit must be done in stages where modules are delivered in sections and assembled on site. Determine whether or not there are activities in the building that will create an occupant load within the building which varies greatly throughout the day and the week. This results in a wider than usual range of cooling loads and complex operating and technical requirements for the chiller plant which are most efficiently met through the use of a modular chiller. Try, if you can, to calculate future cooling load ranges, given that there will probably be more people in your building, newer equipment, and expansion. Whatever you decide, make sure that the cooling system you purchase has all the controls needed to handle these cooling variations. Health Facilities -hospitals, retirement homes, clinics. When it comes to upgrading existing air conditioning systems in a health facility such as a hospital, retirement home or clinic, there are several requirements that must be met. Given that most health facilities are largely underfunded, most buildings are older and still rely on air conditioning technology that is no longer energy efficient. Since the facilities are usually in a business which deals with large numbers of people with health related problems, the buildings are large, multi-storied facilities containing a lot of equipment that generates heat. In most cases, the building was built around the cooling system in either a small mechanical room in the basement or in a small room near the top of the building. Historical Buildings – state capitol buildings, museums, churches. When you have an older building with no air conditioning or an obsolete system that can no longer do the job, you are often talking about a building that was built before air conditioning was even invented. It is usually a building where corridors and doors are only designed only for human passage. Walls are thick, and often the main element of support, as in a brick-built house, making them hard to remove or tear down. The cooling system, if there is one, is in a very small room in the basement. Upgrading the cooling system or installing a new system in an older building is going to be overly expensive and time consuming unless you can do the job without a ny renovations. The new system will have to be small enough to fit in the equipment room and it will have to fit through small doorways and stairways. In some cases, the new system will have to sit beside the old system because the old system can’t be extracted without removing walls and widening doorways. Government and Commercial Buildings – courts, office buildings, banks. In any government or commercial building, the biggest obstacle to replacing the cooling system will to be the impact on the daily operation of the building. With so much depending on the operation of a government or a business, any interruption in the daily activity of the building is to be avoided at all costs. The second major problem is the fact that these buildings require cooling all year long even though these requirements can vary rapidly at any given moment. Extreme wide load variations throughout the year demand that you have more control over the cooling system than is possible. Entertainment Venues – casinos, restaurants, bars, halls, hotels, art galleries. In buildings such as casinos, restaurants and hotels there are often cooling requirements that are unique to all entertainment venues. Entertainment venues are often places that hold many people or often see an extremely large transfer of people. Since the amount of traffic can change quickly, the building usually requires a rapidly changing cooling load that can change to suit each room in the building. Because most entertainment venues are constantly growing, expandability is desirable and necessary. Education and Technical Institutions – universities, colleges, schools, labs, data centres. In most educational and technical facilities, the same problems are often encountered when it comes to upgrading the cooling system. The systems are usually located in the basement in a mechanical room that is small and awkward to access. These systems are often unreliable, inefficient and would cost too much to replace even if that were possible. In some cases, a single cooling source is responsible for supplying air conditioning to multiple buildings. These institutions are unique in their functions for several reasons. Being designed for education and experimentation, they have a large need for heat generating equipment such as computers and lasers, are often in need of expansion, and require a comfortable working environment for students, teachers, scientists, etc. Industrial Processes – plastics, rubber, metal working, plating, die casting, printing, food, pharmaceutical, cosmetics, chemical and petrochemical. It is a common mistake in any typical industrial setting to install a cooling system that is eventually incapable of providing the required process cooling due to expansion. If you have an industrial process where expansion is inevitable but difficult to anticipate or calculate, a modular chilling system is the perfect answer. Designed specifically for future expansion, with fully assembled external water piping our modular chillers are easy to install, remove and re-install for service when required. When you expand your process, a new module can be brought in and installed within a matter of hours with little downtime. Our high efficiency – high EER (energy efficiency ratio) modular chiller system is designed so that chiller units can be field-coupled to meet large tonnage requirements with an ongoing energy savings throughout the life of the chilling system. With a small footprint, these units occupy less space than a larger tonnage unit or units. Our system is specifically designed for future expansions by allowing chiller units to be added in stages to precisely match cooling load requirements. With our microprocessor controller in each chiller and a master control unit incorporating our exclusive “intelligent chiller control program”, we can signal potential problems before they happen, saving costly down time, and stage compressors on system temperature, thereby accurately maintaining the leaving water temperature and saving energy by operating compressors only as they are required. Our control system has its own unique maintenance program operating in the background to manage the following functions: lead-lag compressors, equalize compressor run time, totalize compressor run time for viewing, monitor phase loss and reversal, under and over voltage, and voltage imbalance, prevent compressor short cycling (minimum run time and off time) and stage compressor starts so that one compressor at a time starts to ease inrush current.